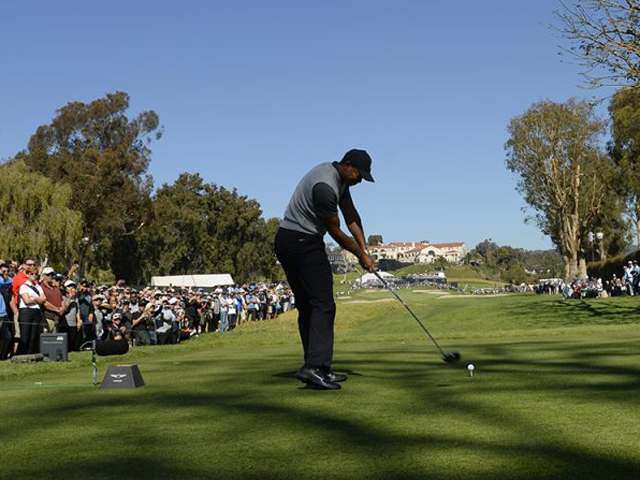 A five-over 76 in the second round put Tiger Woods comfortably outside the cutline Friday at the Genesis Open by four shots at Riviera Country Club after Thursday’s round of 72. This is his 25th missed cut since turning professional in 1996 and 330 career starts. There are two takeaways, both important for Woods, the PGA Tour and golf fans. First, his game needs lots of work starting off the tee. Over an admittedly difficult driving course Woods managed just 13 of 28 fairways or 46 percent while the leaders were hitting two-thirds or better. Less than half the fairways would be fine on some layouts but at Riviera the kikuyu rough makes it often impossible to control the line of a shot much less the distance. So, for two rounds he hit just 16 of 36 greens and was 10 for 18 scrambling…not exactly numbers that bring fear into the eyes of a fellow competitor. Then there’s his putting which was mediocre at best. Fifty-seven putts for the two rounds put him almost exactly in the middle of the pack and not nearly good enough to compensate for his driving problems. For any other 42-year old who hadn’t played a full schedule since 2103 this could be expected but its Tiger Woods and normal expectations don’t apply. Optimistically these words aren’t another example of the Woods answering questions with non-answers but truly a reflection of his thoughts and feelings. Next week is the Honda Classic near his home in South Florida and we will see if he can be competitive at the highest level. The PGA Tour and golf fans need him to be and most of all Woods for himself needs to be.